Living in Delhi is living in insecurity. Does Police ever learn from their past mistakes? Delhi and Mumbai are two cities of India which have faced maximum wrath of terrorism. Innocent people and young children have died in markets from the bombs but brave terrorism risk every day. But it seems that police never learns from its past mistake. Laziness or ignorance of police personnel at street level may become major security threat any time. But to under stand the implication of a small mistake (which I will point out later), let us briefly review the last terror attack in Delhi on Parliament of India. Revisiting the attack on Parliament on 13th December 2001. Terrorist riding in a car which looked like an official car of an MP, passed the first corridor of security. It was at second layer of security that they were suspected and thereafter the terrorist inside the car opened fire and killed police personnel on duty. After a prolonged shoot out the terrorists were gunned down but by then they had killed 6 security personnel besides 8 others. In 2014 the entire Parliament paid homage to these security personal who sacrificed their life on the line of duty in a rather elaborate public function which was televised live. 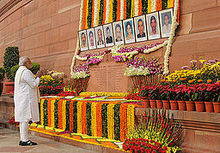 Prime Minister paying homage to martyrs of 2001 attack on Parliament of India. Car No. DL2FDE0063 with red beacon. Last week Sonia Gandhi, the leader of main opposition party was admitted in hospital. She is provided with maximum security by the Police which is called Z class or Z-plus. Needless to say that her husband Rajeev Gandhi was killed in a terrorist attack. He she is high on terrorism risk. While she was inside the hospital, the security around the hospital was beefed up and all kind of usual inconvenience were inflicted upon citizens. No problem. They are used to it. But real story is in the above picture. This vehicle with red beacon on the dashboard was driven around the hospital by a person whom I know is not linked to security or police. How easy it is to obtain possession of this vehicle from this unarmed gullible person? Worse, as seen in the above picture it was parked at an unattended parking for more than 36 hours. I wonder who is the owner of this vehicle but that would not be difficult if somebody wants to find out as the number plate is clearly visible. But the bigger question is why the local beat constable did about it? The local beat constable of police did nothing. Most of the time he can be found just a block away from where this car is parked but he apparently did nothing. Or perhaps he saw and was satisfied that a local shop owner is driving around in a car with red beacon even though private citizens are not permitted to do so. Or perhaps this local shop owner is informant of police or ATS or IB or RAW but why he is so conspicuous? With this kind of negligent policing only God can save us from the terrorist. God help those sitting in drawing rooms, discussing the next plan to deal with terrorist when at the ground level same security lapse continue. 1. Terrorist attack on school in Peshawar, Pakistan. 2. Rhetoric by Hafeez Saeed, a known supporter of terrorist in Pakistan. 4. Terrorist attack in Assam. I wonder if a rogue car with red beacon can roam around, just three kilometer shy of President House and less than 100 meters from one of the most secured persons in the country, what measures police is taking to ensure that 13th December 2001 is not re-visited? 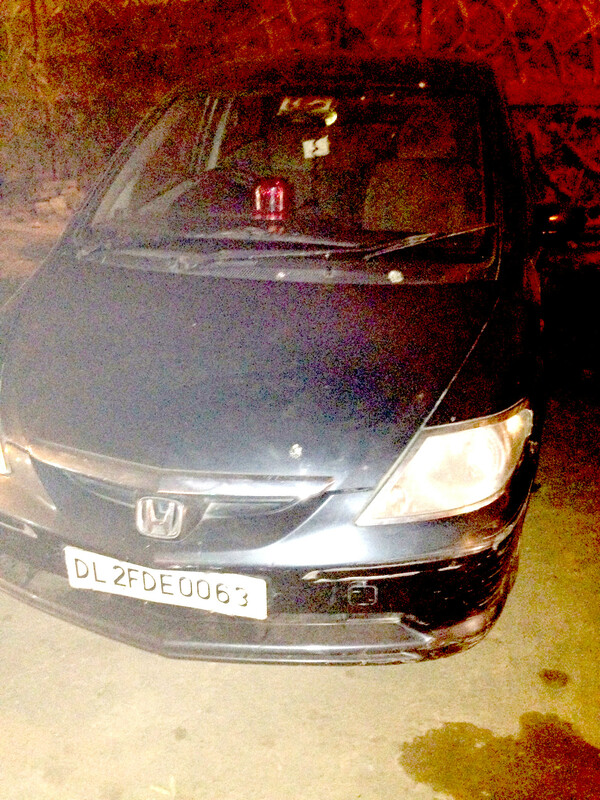 I have asked Delhi Police under Right to Information Act if this car has permission but answer is elusive. After 30 replies from different wings of Police, nobody can categorically say if permission was given or not. No doubt terrorist prone Delhi is terrorist prone. With such inefficient management of information, Delhi Police is just a sitting duck. This entry was posted in Hall of shame, Law and Justice and tagged New Delhi, Police in India, Security risk, Terrorism. Bookmark the permalink.